I belong to a small group of textile artists called Out of Bounds. Every three months we have a challenge set by one of our members. The rules for 2012 were that the piece should be A3 in size, either portrait or landscape. The rest of the rules are set by the challenger. In 2013, we choose the size, A2. As the size was bigger, I decided to try my Dales piece again but larger. The challenge was Gill' s, the theme Winter and the colours were black, white and one other. This was Yvonne's challenge - the theme Spring Layers and colours green and yellow. This was my challenge for 2013 and I set the theme as "Ode to Autumn", a poem by Keats. The colours were reds and greens and two others. This challenge was set by Gill in January and we revealed our work in April. 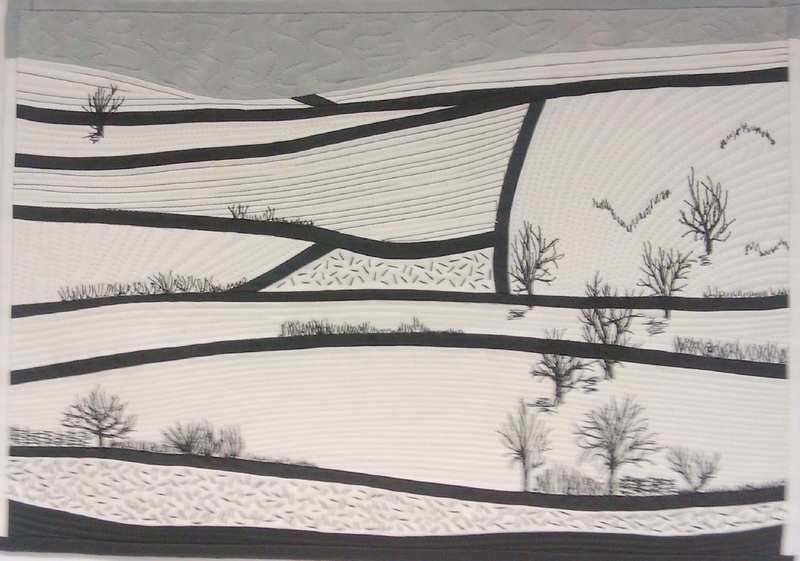 My piece is called The Dales and is based on a picture I found on the Guardian website. The grey sky is hand dyed fabric. The quilt is pieced and stitched by machine and hand. This challenge was set by Yvonne in April, revealed in June and was very difficult!! I choose one of my pictures of local Saxon earthworks known as Wansdyke. It is constructed of hand dyed shibori. The threads are couched down using the embellisher. The grasses at the bottom are hand stitched and the fence, the constrait, is machined. Walnut Whip reminds me of icecream! It is constructed of fabrics shibored in potassium permanganent - lovely colours as the result of pole wrapping. It was free motion quilts and contributed to the demise of my Juki which had to go to the machine mechanic! This is the challenge which I set to be revealed in December. I gave everyone a box in which the piece was to fit. Not sure it was a great idea - but most of us managed a piece.